Join us for our opening reception for a show featuring the works of Trevor Mikula. Time TBD (will be confirmed closer to the date). We will also have a collection of small works just in time for the Holidays! Click here to see photos of the show from the opening reception. There is a bit of the curious child still hiding in each of these artists. They examine the world and take bits of it apart to see how it works. These three artists seldom put the bits back together the way they found it. Under Myles Bennett’s skillful hand the canvas is no longer just a resting place for applied paint. In his new body of work, his careful examination and deconstruction of the structure of this basic artist material turn the strings of the canvas into poems and songs. Saul Gray-Hildenbrand specializes in renderings of mysterious figures, and he finds surprising uses for objects and remnants that had fallen into disuse. He approaches everything with a question and delights in offering you unique answers. Miranda Herrick has made 365 small, colorful drawings (one made on each day of 2017.) Each individual drawing was created as a celebration and meditation for the day it was created and captures a little of her energy and effort from that day. This exhibit is a conversation about the elements (material and ethereal) that compose our daily lives in this fast-paced modern world and the attempt to slow down the world with thoughtful and meticulous examination. Not one of these artists is afraid of a hard day’s work. Tedium as meditation and an intensity of repetition are large parts of this playful, experimental dialogue. Click here to see the photo gallery of the opening reception. Ron Campbell, director of the 1960’s Saturday Morning Beatles Cartoon series and animator of the Beatles film Yellow Submarine will make a rare personal appearance at Bennett Galleries, 2104 Crestmoor Road in Nashville, Tennessee, Friday, January 12th through Sunday, January 14th. Ron will showcase his original Beatles cartoon paintings created specially for the show and create new Beatles pop art paintings at the exhibit. Ron will also feature other artwork based on his 50-year career in cartoons including Scooby Doo, Rugrats, Smurfs, Flintstones, Jetsons and more. The exhibit is free and all works are available for purchase. The legendary animator/director will be exhibiting his Beatles cartoon art as well as painting new works during his appearance. Campbell will also be exhibiting artwork featuring other beloved cartoon characters that encompass his 50-year career in Children’s Television such as Scooby Doo, the Smurfs, Rugrats, Winnie the Pooh, Flintstones, Jetsons, Teenage Mutant Ninja Turtles & more. All works will be available to purchase. Click here to read a feature about Ron in The Tennesseean. Click here to read a feature on Ron in The Tennesseean. DUE TO INCLEMENT WEATHER, THIS RECEPTION HAS BEEN CANCELLED. PLEASE FOLLOW US ON FACEBOOK FOR UPDATES REGARDING THE RECEPTIONS ON SATURDAY AND SUNDAY. Gabrielle Friedman will be at the gallery for a pop-up trunk show. Stop in to browse our selection of beautiful jewelry by this talented maker. Scott Hill, Tracy Sharp, and Stephen Bach. We'll have light snacks and wine on hand, and the artist will be there to meet and answer questions. Terrell all throughout the week. Her work is at the front of the gallery and we'll be having a celebratory reception this Friday, October 20 from 5:30-7:30pm. As always, there is no admission fee, and we'll have refreshments available. Come on by and meet the artist in person and celebrate this momentous occasion with us. Join us for a concert by the Nashville Composers Collective on Sunday, October 15 from 3-5pm. Called the most important collection of his works ever assembled, the artwork to be displayed spans six decades of celebrity portraiture and pop influence. Noted Curator & Peter Max historian Lesley Smith will be in-gallery throughout the art receptions; offering historical perspective, legendary anecdotal “behind the scenes” stories and discussions about the life, times and influences of the Artist. 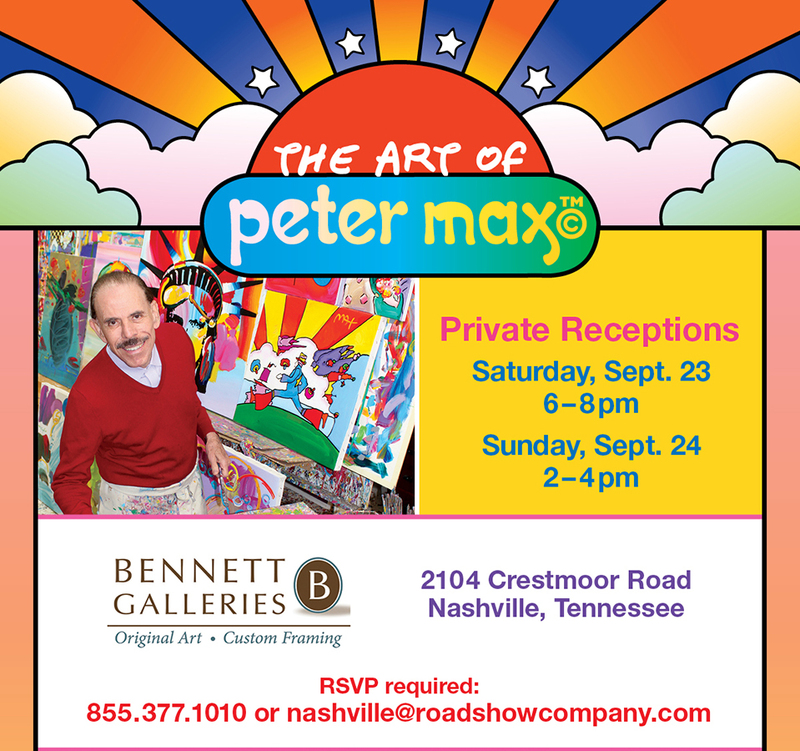 The Exhibition features Peter Max’s most famous works and premiers never-before-seen archival photos and footage from his early career. Iconic Celebrity works of Musical legends on exhibition & available for acquisition. This is the do not miss event of Nashville’s Fall Art Season.